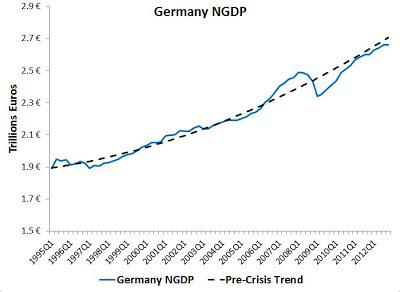 Charles Goodhart has an Op-Ed in the Financial Times and a piece at VoxEu where he comes out swinging against nominal GDP level targeting (NGDPLT). He mistakenly thinks NGDPLT implies targeting real variables and having no long-run nominal anchor. He also thinks flexible inflation targeting (FIT) has been a smashing success so why abandon it now? Like you, I too am puzzled after reading these pieces. Surely Goodhart recognizes that NGDPLT is a money-denominated (i.e. nominal) target and that by definition it is bounded because it is a level target. If anything, it creates a firmer long-run nominal anchor than a "memory-less" FIT. And surely Goodhart is aware that the Great Recession in the United States and the Eurozone crisis occurred under the watch of FIT-type regimes. If FIT is so amazing then why has there been sustained drops in aggregate nominal expenditures in these two large economies? It is especially surprising that Charles Goodhart can still be singing the praises of FIT after seeing what it has failed to do in the Eurozone. 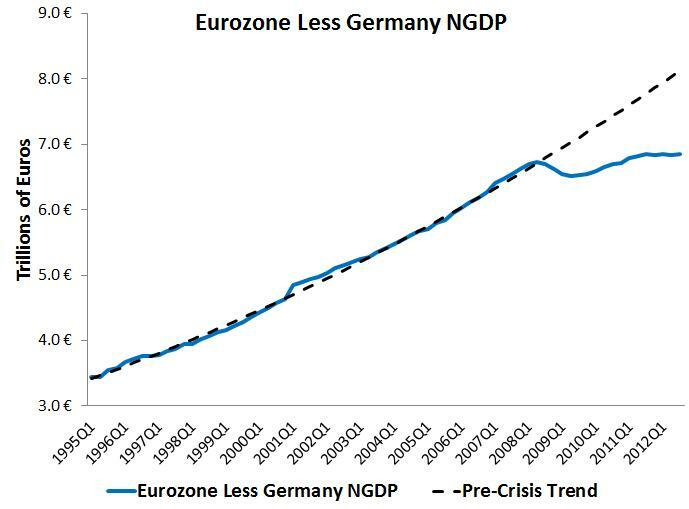 The figures below, which show the Eurozone less Germany, illustrate this point very clearly. 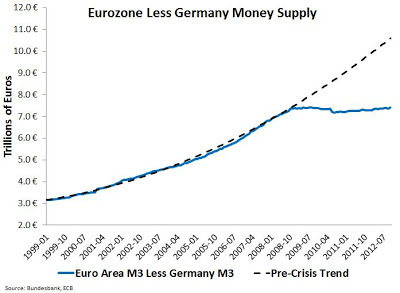 The first one shows that the broad money supply (M3) has flatlined in this region. 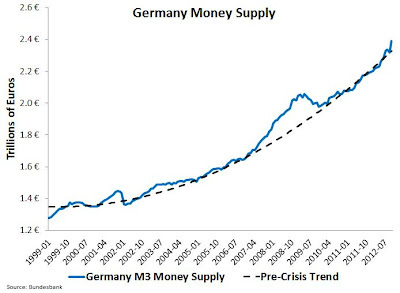 Unsurprisingly, the flatlining of the broad money supply in the Eurozone less Germany region has led to NGDP that has flatlined too (after an initial drop). Adopting a nominal income (NGDP) target is viewed as innovative only by those unfamiliar with the debate on the design of monetary policy of the past few decades. 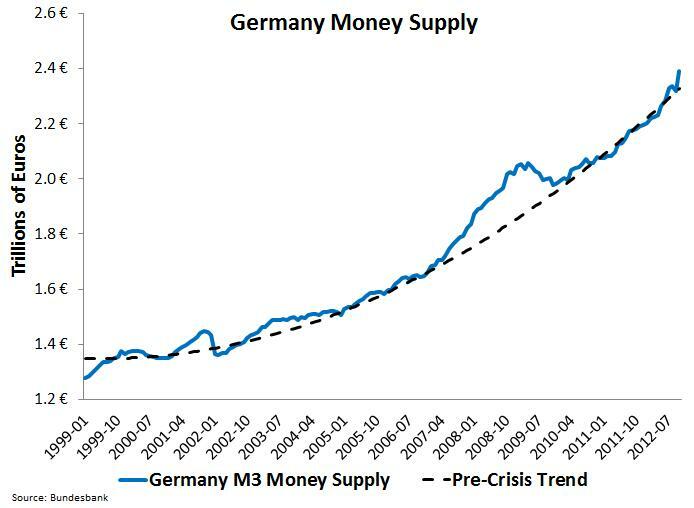 No one has yet designed a way to make it workable given the lags in the transmission of monetary policy and the publication of national income and product. Actually, only someone unfamiliar with the literature on "targeting the forecast" (see Lars Svenson and Michael Woodford) would make this outdated claim about lags. By targeting the forecast, a central bank manages expectations and operates with a lead. Big difference there. Needless to say, there is much more wrong about Charles Goodhart's NGDPLT critique and the untiring Scott Sumner lays out it here and here. [Update: See also the responses of David Glasner, Lars Christensen, Marcus Nunes, and Britmouse.] See here for why NGDPLT provides a strong nominal anchor. Update 1: Saturos nails it on the confusion of NGDP as a nominal variable. Update 2: The Economist swings back at Charles Goodhart and endorses NGDPLT for the UK. David, Goodhart had "three chances" to get it right: In the VoxEu piece, at the debate in Davos and his latest in the FT. He managed to "strike out". I wrote about it, Scott, Britmouse and David Glasner also. He hasn´t read any of it, surely. But what worries me is that if someone of Goodhart´s standing in the 'monetary community' does not understand the basics, what to say of 'simple mortals' policymakers? Marcus, Charles Goodhart needs to read blogs more! I have updated the post to reflect the pieces you guys did. Great work. While I agree with you that NGDP constitutes a nominal anchor and that the cb will target the forecast, I wish market monetarists would stop parotting the libel that inflation targeting failed. Apart from in the UK, inflation targeting has delivered what it sets out to do - hold inflation close to the target. The idea is that this provides the framework of price stability within which the other economic authorities work, including the government which is supposed to strive for fiscal stabilisation and structural promotion of growth, and regulators who are supposed to pursue financial stability. As Bernanke put it in his book on inflation targeting "the maintenance of low and stable inflation is important, perhaps necessary, for achieving other macroeconomic goals" (note "necessary", not "sufficient"), or as the ECB continues to explain it on their website ( http://www.ecb.europa.eu/mopo/intro/html/index.en.html ) "price stability....is the best contribution monetary policy can make to economic growth and job creation". 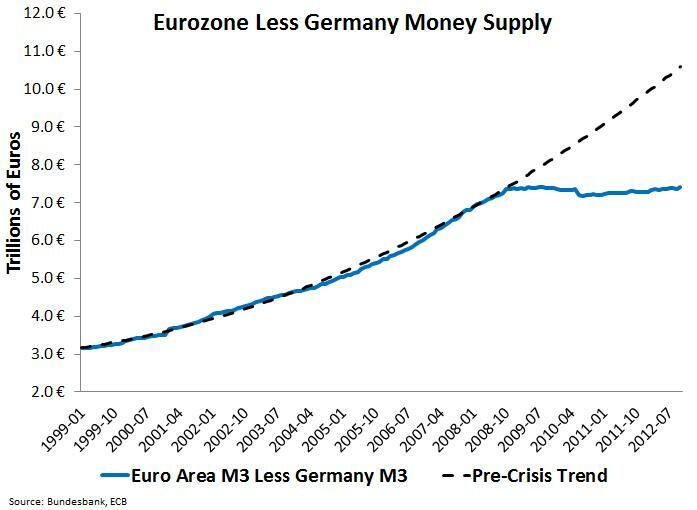 The problem was that some of these other measures - like fiscal prudence and reform - are unpopular, and the non-monetary authorities did not deliver. Rich countries usually don't grow GDP 5% year after year after year. 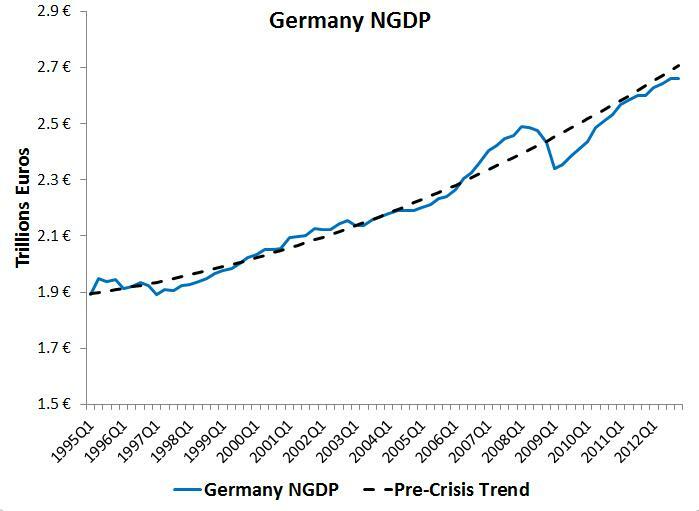 3.5T with 4% annual growth for 15 years would equal 6.3T If the RestOfEurope grew twice as fast as Germany, it's expected NGDP trend line would show that the period of 1995-2008 was a bubble, and now back on the expected trend. 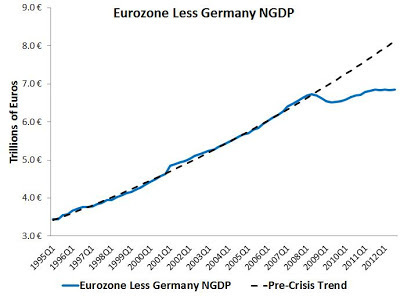 The expectation of GDP growth for RestOfEurope has been set unrealistically high. Setting these unrealistic NGDP growth expectations distorts the real world. Fantasy vs. reality. and when it stopped, Germany was able to transfer the backlash to the others ...? but what was it ? any idea ? Is "Precautionary Saving" Still a Problem?